Thomson Reuters has named Timothy Beers, the University of Notre Dame Chair of Astrophysics, and Prashant Kamat, the Rev. John A. Zahm, C.S.C., Professor of Science, to its 2016 Highly Cited Researchers list. After Reuters analyzed Essential Science Indicators that included 128,887 highly cited papers ranked in the top 1 percent by total citations, the work of Beers and Kamat stood out as being among the most valuable and significant in their fields. Beers and Kamat were named among the world’s most influential scientific minds not only for publishing a significant number of research papers, but also for authoring reports that ranked among the top 1 percent in their respective fields over an 11-year period, 2004-2014. It is estimated that researchers around the world publish in excess of 2 million papers, and the Highly Cited Researchers list names more than 3,000 researchers who have global impact. 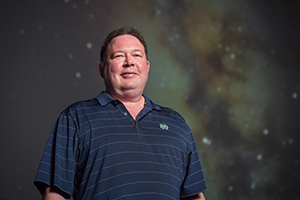 Beers, an associate director and co-principal investigator for the Joint Institute for Nuclear Astrophysics-Center for Evolution of the Elements, is internationally known for his work on investigating the origin and evolution of the elements of the universe and the assembly of galaxies such as the Milky Way. Over many decades, Beers directed large-scale surveys of stars in the Milky Way, reviewing millions of stars to identify those that best represent the chemical history of the universe in their atmospheres. His team discovered the moderate to high r-process-element enhanced stars, now known as r-I and r-II stars; discovered the so-called carbon-enhanced metal-poor stars, a subset of which are now known to be the direct descendants of the very first stars; and recently was responsible for creating the first chronographic (age) map of the Milky Way’s halo system, followed by the recent publication of a higher-resolution age map in the December issue of Nature Physics. He has authored more than 400 peer-reviewed publications that have been cited over 40,000 times. An innovator in the field of light energy conversion, Kamat is professor in the Department of Chemistry and Biochemistry and the Radiation Laboratory, a concurrent professor of chemical and biomolecular engineering and editor-in-chief of ACS Energy Letters. He has published more than 450 peer-reviewed publications, eight of which have been cited over 1,000 times. His 450 peer-reviewed publications have been cited more than 50,000 times and signify an h-index of 119. 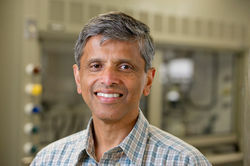 Kamat has made significant contributions to four areas: photo-induced catalytic processes using semiconductor and metal nanoparticles, nanostructures and nanocomposites; development of light energy harvesting assemblies for next generation solar cells; use of carbon nanostructures as conducting scaffolds to collect and transport charge carriers in solar cells and fuel cells; and environmental remediation using advanced oxidation processes and chemical sensors. Originally published by Marissa Gebhard at news.nd.edu on December 19, 2016.